Bergantino at Bass Club Chicago, the Midwests ONLY Platinum Dealer of Bergantino products! Bergantino at Bass Club Chicago, the Midwests ONLY Platinum Dealer of Bergantino products! 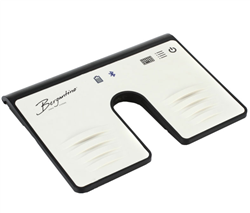 We have every Bergantino product in stock, and available for trial in our private demo room. 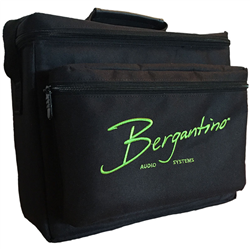 Protect the investment you have made in your amplifier with this custom carry bag. The main, padded internal compartment is sized for your Bergantino amp and allows extra space for the knobs and encoders when transporting your Bergantino amp. An extra zippered pouch on the side has a large opening designed for cables and accessories. 2.402GHz to 2480GHz Approximate Range: 33 feet (10 Meters) – sub. to orientation and other factors HDN112 ‘High Definition Neo’ Series 1-12″ & Tweeter Bass Guitar Loudspeaker The Bergantino Audio Systems HDN (High Definition Neo) series lightweight speaker cabinets retain the great Bergantino Audio sound and give you the weight savings but not at the expense of tone and performance. The HDN series is available in four driver configurations; 1-12” w/ Tweeter, 2-12” w/ Tweeter, 2-10” w/ Tweeter and 4-10” w/ Tweeter. These are the finest lightweight speaker cabinets made. The precision tuned cabinet architecture and the enclosures are built with the highest quality lightweight Italian poplar plywood (with Baltic birch baffle boards) selected to our demanding specifications. This lightweight cabinet material (along with the lightweight magnet material) helps reduce the overall cabinet weight. The exterior of these speaker cabinets are finished in a durable bronco tolex covering for long life and cabinet protection. A rigid black grille is added to protect the drivers from damage and to minimize the coloration and tone reduction found with a cloth speaker grille. The internal components utilize high quality, custom designed woofers along with a superlative sounding, compression driver mated to a constant directivity horn. The constant directivity horn ensures consistent coverage throughout the audio spectrum, and a custom designed, phase coherent crossover seamlessly mates these components throughout the critical crossover region. Reference series woofers utilize ceramic magnets w/ vented pole pieces and the low-end is full and round. Along with their high power handling capability, the Reference series are a very versatile speaker cabinet; excelling at both finger style and pick playing, and due to their tight-creamy low end are an excellent choice for slap-style as well. Bergantino’s Reference series cabinets produce an accurate, full-bodied and authentic representation of your bass guitar in both live and studio settings. Weight: 6 lbs. This cab was definitely designed with "old school" tone in mind but with the added 6" for Mid-range gives you lots of clarity with a smooth warm tone. We here at Bass Club have heard just about ever 15" speaker cab on the market and this is one of the most full range 15's we have heard. 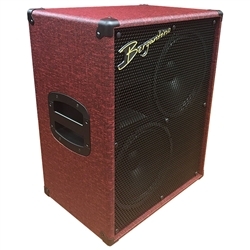 Whether youre planning on using this cab by itself or if your looking to add some "lows" to your current setup, this is GREAT option. You cant go wrong with a Berg. This cab has both 1/4 and speakon connections. The Bergantino Audio Systems HDN (High Definition Neo) series lightweight speaker cabinets retain the great Bergantino Audio sound and give you the weight savings but not at the expense of tone and performance. The HDN series is available in four driver configurations; 1-12” w/ Tweeter, 2-12” w/ Tweeter, 2-10” w/ Tweeter and 4-10” w/ Tweeter. These are the finest lightweight speaker cabinets made. The precision tuned cabinet architecture and the enclosures are built with the highest quality lightweight Italian poplar plywood (with Baltic birch baffle boards) selected to our demanding specifications. This lightweight cabinet material (along with the lightweight magnet material) helps reduce the overall cabinet weight. The exterior of these speaker cabinets are finished in a durable bronco tolex covering for long life and cabinet protection. A rigid black grille is added to protect the drivers from damage and to minimize the coloration and tone reduction found with a cloth speaker grille. The internal components used are extremely high quality and they are of Bergantino design. No ‘off-the-shelf’ parts are used. Our new design Neodymium magnet woofers (unique to the HDN) are used for the low frequency section of the HDN series cabinets. These Neodymium drivers have a punchy low-end and a very sweet midrange that is placed a little more forward in the sound field when compared to the HD series. Fretless and upright players will often prefer the HDN cabinets because of how the midrange ‘speaks’ with their instruments. The HDN series cabinets have a new design high intelligibility tweeter mated to the woofers through a custom designed phase-coherent crossover with a tweeter control. Because of the increased cost of the Neodymium magnet material and imported wood for the cabinetry, the HDN series speakers cost more than the HD series, but may just be the right match for your playing style and weight needs. The Bergantino Audio Systems ‘Holo-Graphic’ HG series of lightweight speaker cabinets break the barrier of 2-dimensional sound. Three woofers are mated to a lightweight sealed cabinet with 2 facing forward and a third facing rearward. This speaker orientation generates a 3-dimensional soundstage that makes any solid-body instrument come alive and project a superior depth of sound. The HG310 is the perfect speaker cabinet to reproduce all instruments including fretless electric bass, upright bass, acoustic bass guitar, acoustic guitar, ‘f-hole’ jazz guitar, mandolin, banjo and violin. It will also transform your solid-body violin, viola, cello or upright bass from a single point source into a 360-degree experience. Weight: 35 Lbs. HDN212 ‘High Definition Neo’ Series 2-12″ & Tweeter Bass Guitar Loudspeaker. The Bergantino Audio Systems HDN (High Definition Neo) series lightweight speaker cabinets retain the great Bergantino Audio sound and give you the weight savings but not at the expense of tone and performance. The HDN series is available in four driver configurations; 1-12” w/ Tweeter, 2-12” w/ Tweeter, 2-10” w/ Tweeter and 4-10” w/ Tweeter. These are the finest lightweight speaker cabinets made. The precision tuned cabinet architecture and the enclosures are built with the highest quality lightweight Italian poplar plywood (with Baltic birch baffle boards) selected to our demanding specifications. This lightweight cabinet material (along with the lightweight magnet material) helps reduce the overall cabinet weight. The exterior of these speaker cabinets are finished in a durable bronco tolex covering for long life and cabinet protection. A rigid black grille is added to protect the drivers from damage and to minimize the coloration and tone reduction found with a cloth speaker grille. Bergantino HG410 Bass Cabinet - only 47 pounds! Bergantino Audio Systems introduces the newest addition to our HG series, the HG410! Coming in at just 47lbs., and the size of our 212 cabinets, it’s the lightest and smallest 410 in the industry. The BIG BROTHER to our renowned HG310, the HG410 also offers the benefits of a sealed design, for immediate and accurate bass response, our high quality, Reference tweeter for airy and transparent highs, and a rear firing woofer to create a 3-dimensional sound field. Available in our black Bronco Tolex with gold logo. Shipping in mid-March 2018. As with all of our Bergantino Audio Systems loudspeakers, the internal components used are extremely high quality and they are of Bergantino design. No ‘off-the-shelf’ parts are used. Woofers with Neodymium magnet material are used for the low-frequency section of the HG series cabinets, resulting in a very clear sound, punchy low-end, sweet midrange and reduced weight. The HG series cabinets have a High Intelligibility Compression Driver w/ Constant Directivity Horn to ensure consistent coverage from the lowest to the highest frequencies. This horn is mated to the quad-woofer arrangement through a custom designed phase-coherent crossover with a tweeter control. The HG410 cabinets are covered in black Bronco tolex, have mounted rubber feet and include a high-impact metal grill for durability and acoustical transparency.